I thought the snow was going to clear yesterday, but I woke up to even more of the white stuff. In fact our summer house now looks like a Swiss Chalet. And the garden looks very dramatic. Those of your who DON'T live in the UK probably think snow is no big deal, but to us it happens so rarely as soon as there is a sprinkling of snow on the ground, we get all giddy and can't wait to start taking photos. Because of the snow it has been pretty difficult for me to get out the house apart from a brief foray into College on Tuesday, so I've been knitting pretty constantly. I was glad I got to college as I now have worked out where I went wrong on my textured hat. The tutor was able to point out the problem immediately and I was able to get it finished. So here is my finished hat. I particularly like the leaf motif, which is used to do the increases from the ribbing. The moss stitch wasn't much fun, but it does look good now it has been finished. At College we learned how to do twisted rib, which forms part of my February square for my KAL Blanket. I have been doing it the long way using a cable needle to move one stitch behind the other. My tutor explained to us that you could knit into the second stitch on the needle, before knitting into the first stitch, and then slide both off together. This simple revelation has speeded up my knitting of the blanket square no end. 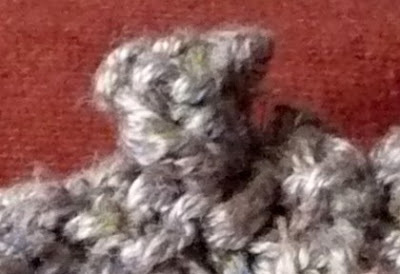 Make bobble by knitting into next stitch 5 times, turn, P5, turn, K5, turn, P2 tog, P1, P2 tog, turn, K3 tog. K1, P1, K1 into next stitch, turn K3 into these stitches, turn P3, turn K3, turn P3. Take the back 2 stitches over the first stitch. I think the blanket bobble is much rounder and sits closer to the body of the knitting and produces a smaller hole on the wrong side of the knitting. I know some of that is due to the hat being knitted in a thicker more slippery yarn but I think it is still the better bobble. I am really enjoying the textured knitting class. I am also glad I chose to do mainly textured squares for my blanket, as it ties in nicely with the class I taking. I will probably do the coloured blanket squares when the novelty of cabling has worn off and I want to make something a bit more flowery. Knitting is very exciting at the moment. Maybe we should do a swap - you knit something for me and I'll stitch something for you? Now this is an idea I like LOL! I think I would get the better side of that bargain though, as I KNOW that stitching takes lots longer than knitting. Oh I LOVE the hat!! It looks really good on you. Thanks, I'm pretty pleased with it too. However, it does not go with my grey winter coat, so it will stay in the display cabinet at college until I change to my spring wrap! The seed stitch was a BIT of a nightmare, but it didn't take too long. However, I don't think I'd be repeating it any time soon!